The reputation of our Bertie County Peanuts has spread far and wide and we now have folks stopping by to see our peanut "trees". After some serious discussion and a trip to the peanut field, our visitors leave with the newfound knowledge that peanuts grow in the ground, not in a tree. 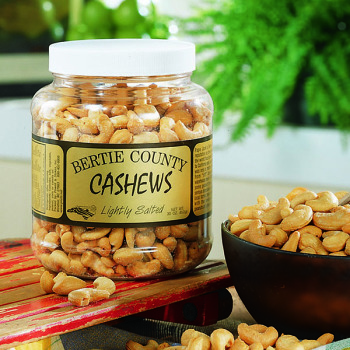 But, no matter what, these Cashews taste great (they're tree nuts!). 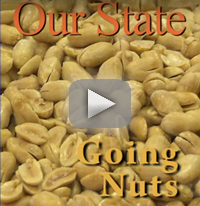 But, don't take our word for it, try these lightly salted, oil roasted nuts and see for yourself! Very good Cashews however they where pretty broken up but they still tasted good! 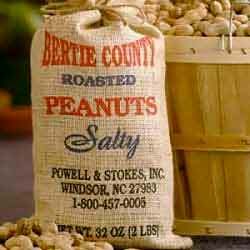 The cashews from Bertie County Peanuts are the very best I have ever eaten. They are fresh and perfectly salted. My husband loves them, too!! Will order more, for sure! My son is the cashew lover in the family and said these were really good. Much better than Planter's. Wow, those are some good Cashews! All my neighbors and friends that helped us eat'em up won't need to read a review to order some. They'll probably be back at my house looking for more this weekend. Best Cashews ever. My wife & I purchased the Weeping Mary Ghost Pepper peanuts, the lightly salted cashews and a burlap bag of shelled nuts. All were fantastic. I can't walk by them in the kitchen without grabbing a handful. Yummm! Owner Response:Sorry to hear that. The cashews are not unsalted, but they are very lightly salted. We'll be in touch. Again, just not your strength. Cashews were ok but didn't separate you from the competitor and I would not rebuy...??? Have not opened these yet since it is a gift but in times past, they are wonderful. Not the best - I have had better, a little overcooked I think. Disappointed. Mixed whole cashews with lots of pieces. Overpriced for quality. Owner Response:We'll be in touch to rectify this situation. Great! Caused a fight over them at our place! Service was outstanding.